Keep your Socket 775 CPU cool, for optimal system performance; designed for low profile computer cases. This Low Profile 70mm Socket 775 CPU Cooler Fan is designed specifically for use with processors in rack-mounted and low profile mini systems. Suitable for Dual Core and high-speed Pentium 4 processors, the low profile Socket 775 CPU Fan is compatible with Intel Socket LGA775 P4 (up to 3.8 GHz) and Dual Core processors and features a dual ball-bearing 70mm fan for exceptional cooling and extended service life. 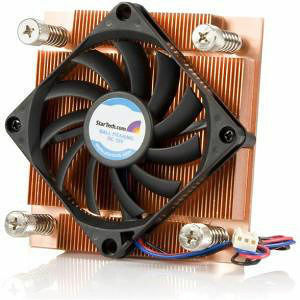 The CPU fan also features a built-on all-copper base skive fin heatsink and includes our thermal CPU paste that helps the cooling capability of the CPU cooler by thermally bonding the CPU to the heatsink for greater dissipation. Powered through a simple TX3 connection to the computer power supply, the Socket 775 CPU cooler is backed by 2-year warranty.